Robert Lee Doughton, powerful Congressman and advocate for western North Carolina, was born on November 7, 1863, to Jonathan Horton and Rebecca Jones Doughton. He was named for the Confederate general under whom his father served. Doughton was raised in the Laurel Springs community in Alleghany County and was educated at Laurel Springs School and Traphill Academy. A farmer by trade, Doughton began a career of public service with his appointment to the state Board of Agriculture in 1903. He served in the state Senate in 1908 and 1909. 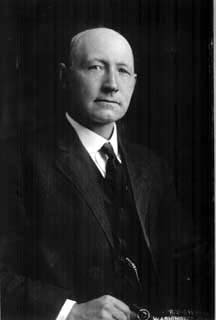 In 1911 Doughton became president of the Deposit and Savings Bank of North Wilkesboro. He served in that capacity until the bank merged with the Northwestern Bank in 1936, after which time he was chairman and director of the bank. Doughton worked his way to the chairmanship in 1933. Serving eighteen years, he was chairman of Ways and Means longer than any other member. Doughton took great pride in his role in the preparation and passage of the Social Security Act of 1935. He was instrumental in the creation of the Blue Ridge Parkway, the ground for which was broken in his home county in 1935. Robert Doughton married Belle Boyd Greer in 1893. The couple had a daughter before Belle’s death in 1895. In 1898 Doughton married Lillie Stricker Hix. Together they had two sons. 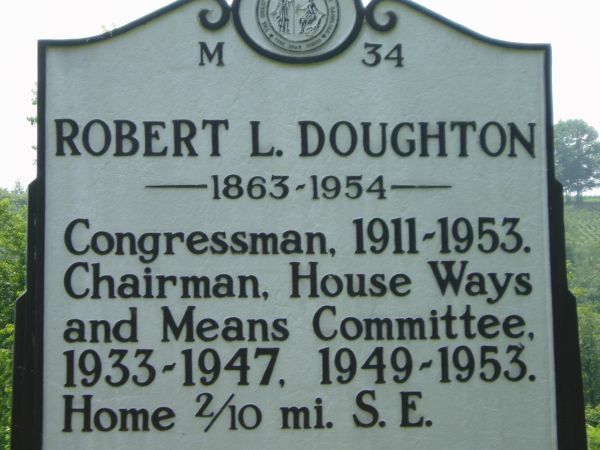 Robert L. Doughton died October 1, 1954, in his bed at his home in Laurel Springs. He is buried in the Laurel Springs Baptist Church Cemetery. This page was last updated August 31, 2007.